This Hmong village has preserved their simple but splendid traditions and lifestyles. 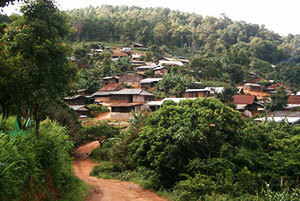 The village can be reached by taking a left turn at Km.12 and proceeding for 7 kilometers. Only four-wheel vehicles in good condition can make the trip. Along the route, you can visit resorts which are open to visitors, including Mae Sa Valley, Mae Sa Resort (offers a 9-hole golf course), and Kangsadan Farm.